The massive radio galaxy PKS 0745-191, for which the cluster is named, appears at the center of this Hubble Space Telescope image. The picture forms the inset in the Suzaku image above. Astronomers took a peek at the first X-ray image of anentire galaxy cluster, courtesy of a Japan-U.S. space observatory. The target cluster known as PKS 0745-191 lies 1.3 billionlight-years away in the southern constellation Puppis. The Suzaku observatory("red bird of the south") took five images of the cluster's million-degreegas during last May.
? "These Suzaku observations are exciting because wecan finally see how these structures, the largest bound objects in theuniverse, grow even more massive," said Matt George, an astronomer at theUniversity of California-Berkeley. By looking at a cluster in X-rays, astronomers canmeasure the temperature and density of the gas, which provides clues about thegas pressure and total mass of the cluster. Astronomers expect that the gas inthe inner part of a galaxy cluster has settled into a "relaxed" statein equilibrium with the cluster's gravity. This means that the hottest, densestgas lies near the cluster'scenter, and temperatures and densities steadily decline at greaterdistances. In the cluster's outer regions, though, the gas is nolonger in an orderly state because matter is still falling inward. 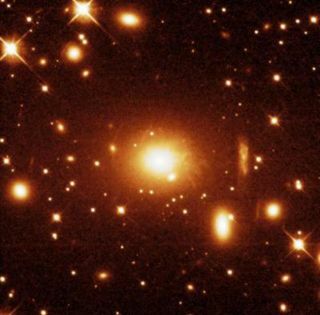 "Clusters are the most massive, relaxed objects inthe universe, and they are continuing to form now,"said team member Andy Fabian at the Cambridge Institute of Astronomy in the UK.The distance where order turns to chaos is referred to as the cluster's"virial radius." For the first time, this study shows the X-ray emissionand gas density and temperature out to — and even beyond — the virial radius,where the cluster continues to form. "It gives us the first complete X-rayview of a clusterof galaxies," Fabian said. In PKS 0745-191, the gas temperature peaks at 164 milliondegrees Fahrenheit (91 million C) about 1.1 million light-years from thecluster's center. Then, the temperature declines smoothly with distance,dropping to 45 million F (25 million C) more than 5.6 million light-years fromthe center. The findings appear in the May 11 issue of the journal MonthlyNotices of the Royal Astronomical Society. To discern the cluster's outermost X-ray emissionrequires detectors with exceptionally low background noise. Suzaku's advancedX-ray detectors, coupled with a low-altitude orbit, give the observatory muchlower background noise than other X-raysatellites. The low orbit means that Suzaku is largely protected by Earth'smagnetic field, which deflects energetic particles from the sun and beyond. "With more Suzaku observations in the outskirts ofother galaxy clusters, we'll get a better picture of how these massivestructures evolve," George added. The Suzaku observatory mission launched July 10, 2005.